As the Scouse industrio-anarchists announce their latest goings-on, Getintothis‘ David Hall takes a peek between the pages. The KLF have announced their latest event, a book signing with a post-apocalyptic difference titled the Ice Kream Van Kometh, to take place in the dead of night on Bold Street in Liverpool’s city centre. 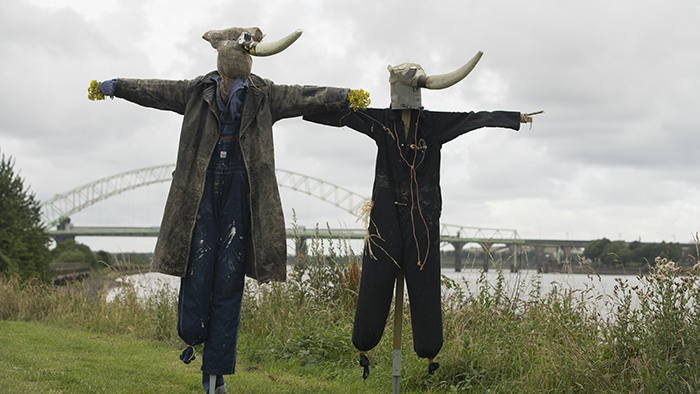 To celebrate publication of their novel 2023, The Justified Ancients of Mu Mu – better known as The KLF – will arrive in their Ice Kream Van at News From Nowhere on Bold Street in Liverpool 23 seconds after the clock strikes midnight on August 23. After the group alight from their Ice Kream Van, News From Nowhere will become the first bookshop in the world to sell copies of 2023. Punters will then be able to buy stamped copies of 2023 from The Justified Ancients of Mu Mu, at a limit of one copy per customer. Not-for-profit radical and community bookshop News From Nowhere will then go on to host The Justified Ancients of Mu Mu until the last customer’s copy has been stamped and sold, at which point they will disappear in their Ice Kream Van once again. 2023 itself meanwhile has been described by the group themselves as “a utopian costume drama set in the near future written in the recent past”. No review copies of this book are available until the day of publication. So more accurately, The KLF will arrive outside News From Nowhere on Bold Street at 00:00:23 on Wednesday August 23. To be clear, set out on Tuesday evening to catch the event.